An inspiring recording for connecting with your natural source of health and vitality. Uplifting melodies performed on keyboards, harmonium, and thumb piano are blended with world percussion, Sanskrit chant, and the healing sounds of Tibetan singing bowls. Listening and even chanting along with this inspiring recording will help you to create both inner and outer harmony as you connect with your own natural source of health, vitality, and well-being. The enclosed booklet contains listening exercises that you can use to create your own personal healing practice. 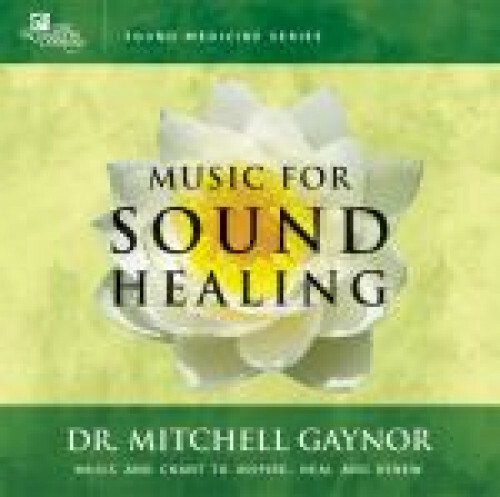 These are the same sound healing practices that have benefited thousands of Dr. Gaynor’s patients over the years. Mitchell Gaynor, MD, is a board-certified medical oncologist, internist, and hematologist. Dr. Gaynor is founder and president of Gaynor Integrative Oncology in New York City, and assistant clinical professor of medicine at Weill-Cornell Medical College. He has led sound meditation groups for his patients for many years, as well as sponsored spiritual retreats in southern India. He has pioneered the use of sound, chanting, and music in conjunction with metal and crystal singing bowls as an adjunct to conventional medical therapy. This practice has benefited thousands of his patients and has been featured in the New York Times, Newsweek, Body and Soul, Spirituality and Health, and on CNN, PBS, Fox News Channel, and the Discovery Channel.